The web has changed, the web is always changing. As recent as a few years ago, an effective online presence meant a good website. A company had to do little more than hang up its virtual sign, and wait. Today, the web is different. To be effective, a business has to be found. A website alone is no longer enough. To be effective on the Internet, a business has to be found in search, on social media, on directory and review sites, on online maps, and in many other places. All of these need to point to a user-oriented website. We call this Online Presence. Your digital footprint may be larger than you know, and often the information may be out of date or contradictory. Keeping track of Online Presence can be confusing, and a time-consuming process. 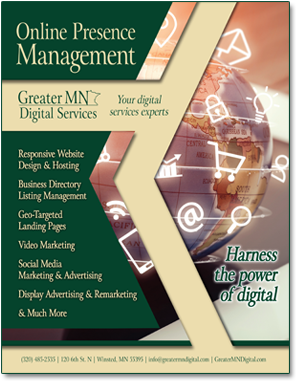 Let Greater MN Digital Services help manage your Online Presence for you, so you can focus on your business. See how your business appears across the internet by running a custom scan below.